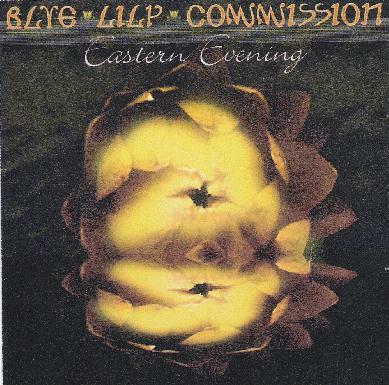 Blue Lily Commission - "Eastern Evening"
Blue Lily Commission is an ambient ethnic space project from musician and sci fi novelist Stephen Palmer, who you may also know as a member of Mooch (see Mooch review this issue). Eastern Evening is Steve's fourth Blue Lily Commission album and is a solid hour of mind expanding progressive ambient space rock, drenched with ethnic influences and dashes of groove laden electronica. "The Spear" opens the set with ethnic percussion and call-to-prayer horn that sets a cool cosmic groove against a flowing ambient backdrop. The heavy rhythmic pulse is key to the Blue Lily sound and Steve even spices things up with a rolling jazzy-techno bit combined with alien electronics, which keeps things varied and continually on the move. It's a great cross section between meditative massage, space electronics and inter-galactic grooves. "Eastern Wasteland" takes us into deepest space with it's multiple layers of morphing and soaring keyboard lines and electronic patterns. On the one hand it's busy and ever expanding, yet the seductive, calming melodies have a comfortably hypnotic affect. At just over 11 minutes, "Symbolic" is the longest track of the set and is pure space voyage. The mood is contemplative and Steve has again created a solid melodic flow. Yet he also injects just enough dance elements to keep the rhythmic pace active without being overwhelming. Some of this has me imagining what the Ozric Tentacles might sound like if they were a more ambient oriented band. "Seraglio" is one of my favorite tracks of the set and one that space rockers will love. It has a bit of a Pink Floyd vibe underlying the trademark Blue Lily Commission spaced out ethnic stylings, and high energy rocking bits alternate with the meditative segments. Excellent! "Red Earth" and "Perpetual Flute Commission" are two other rocking highlights that are embellished by killer stinging guitar licks. "Evening" is (as the title suggests) one of the darkest and most purely atmospheric tracks of the set, with flowing drones, slow, steady percussion and gothic chants, along with the usual spaced out fun. And "Indian Storm" is similar but with a more uplifting, majestic aura around it. In summary, Eastern Evening is a powerful set of deep space music. It's really hard to classify Blue Lily Commission. The music has far more going on than the typical space ambient artist. There's much here to appeal to the trance crowd, but has a complexity and variety that transcends that genre. There's certainly plenty here for space rockers to enjoy. And prog rockers with a taste for space would definitely appreciate what Steve is doing. Recommended. For more information you can visit Stephen Palmer's web site at: http://www.stephenpalmer.co.uk. Visit the Rubbish Records web site at: http://www.rubbishrecords.co.uk.